I’m sure you all know about “Knitting Daily TV,” the fiber-arts-focused show produced by Interweave for PBS. The show is in its 11th season and has been hosted all that time by Eunny Jang, who was editor of Interweave Knits until earlier this year. 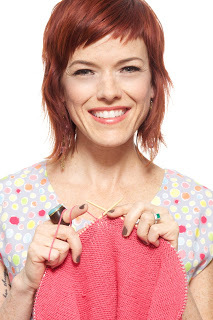 Vickie, of course, is well-versed in the world of crafty TV, having hosted “Knitty Gritty” for eight seasons, as well as being the co-host of “Styleicious,” among other projects. “Knitting Daily TV” is considered the longest continuously running fiber arts show in production (counting some time as “Needle Arts Studio with Shay Pendray”; it became “Knitting Daily TV” in 2010). The show’s format has changed some through the years but it focuses on knitting and crochet instruction, learning about yarn and project tutorials. In a press release, Vickie said she “can’t wait to be back in fellow stitchers’ living rooms sharing my passion for yarn-crafts and the vibrant community surrounding it.” The feeling is mutual! I was really sad to hear Eunny was leaving IW and KDTV, and this news makes it worse. Vickie’s site and patterns always seemed to me to be aimed at pre-teens. I hope the standard of KDTV doesn’t sink that low. I agree. While I don’t dislike Vickie Howell, I have not seen even one single pattern of hers that I would ever consider making. I also really dislike the fact that her name is in the title. It would be different if Eunny’s name had been in the title before. This seems egotistical. On the screen shots I have seen, I have seen no mention of other people I love, like Kristen Omdahl, Laura Bryant and Barry Klein, Shay Pendray, and Clara Parkes. All I have read is Vickie saying, “I, I, I,” and “my, my, my.” Why did Eunny leave? I truly hope Kristen Omdahl did not leave, too. And I hope the show doesn’t start featuring those childish, clunky, unsophisticated type patterns I associate with Vickie Howell. Vickie turns me off. Her facial expressions look like she is so bored with her guests. Its like she’s being put upon to have the guest there and would rather do the whole show by herself.